Kitchen Window — Oranges: Secret Agents Of The Food World Like an international secret agent, the zest of tangerines and mandarins and oranges finds its way into Szechuan stir-fries, Mesopotamian couscous and Iberian sweets. 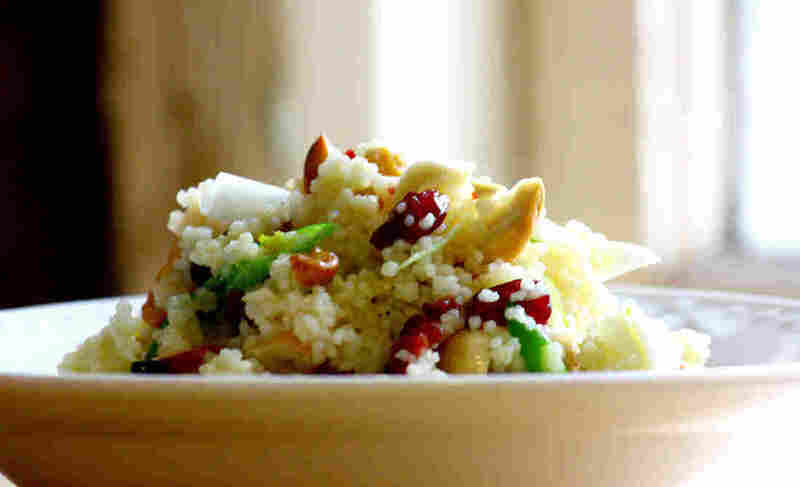 Get recipes for Couscous With Dried Cranberries, Cashews And Orange, Chicken Snow-Pea Stir-Fry With Tangerine Peel and Orange, Almond And Pine Nut Tartlets. For me, the citrus fruits of winter have been bright spots in a long, frost-bound season. The lemons, the oranges, the sweet little clementines, the tart, brawny grapefruits — they glow like miniature suns on the grayest afternoons. As we — finally — turn the long, slow corner in the spring, I love them all the more for knowing they will soon be gone. The flavor we love in the flesh of a citrus packs even more power in the zest. When citrus are abundant, you can eat the peels all by themselves, as we do in preserved lemons and chocolate orange rinds. But as the sunset-colored stockpiles dwindle, I look for stealthier ways to make the most of them. Whatever the reason, that sweetness insinuates itself with equal finesse into desserts and savory dishes. So great is the allure of the orange peel that you can find it, dried or fresh, in recipes from all over the world. Like an international secret agent, the zest of tangerines and mandarins and oranges finds its way into Szechuan stir-fries, Mesopotamian couscous, Iberian sweets. It forms hidden liaisons with ginger. It infiltrates cream and butter. It engages in furtive handoffs with almonds and pine nuts, leaving behind its telltale scent and turning an after-dinner tart into the world's most aromatic dead-drop. 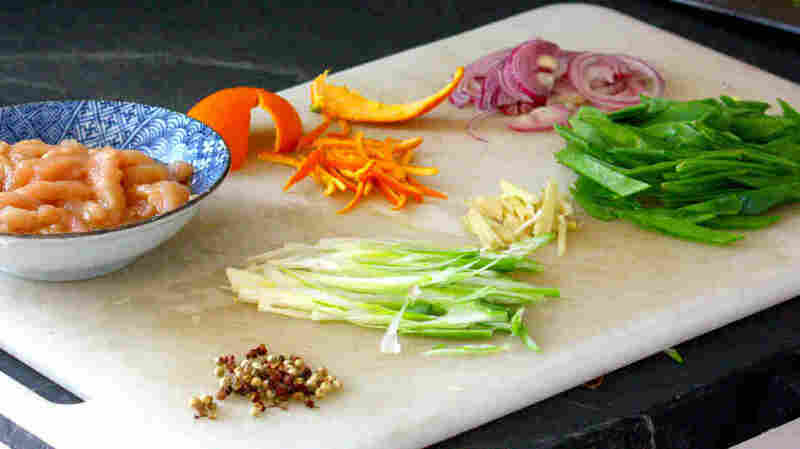 If it's fresh, you can grate the peel, or slice it in fine strips; if it's dried, you can soften it at a liquid simmer or blitz it in a spice grinder. You can double down on the orange effect by replacing some of the liquids in your recipe with orange juice. Failing all of these, you can always resort to a bottle of orange extract, unless you feel that that's too much like cheating. Whatever you do, don't wait. Citrus season is long, but it too must come to an end. The best of the oranges will vanish from crates and bins and stands, leaving only a few hard-traveled, flavorless, orange-shaped doppelgangers in their wake. The real orange, that international fruit of mystery, will be back in its own sweet time. This simple couscous from Kathy Brennan's and Caroline Campion's Keepers (Rodale, 2013) is a lifesaver on a weekday, yet dressy enough for company. You can substitute any other nuts and dried fruit — pistachios and apricots make a nice variant; practically any combination will be smashing. Prepare the couscous as directed. Meanwhile, in a small bowl, whisk together the orange zest, orange juice, maple syrup and oil, then season with salt and pepper. Pour the dressing over the warm couscous and gently toss to combine. Add the cranberries, cashews and scallions and gently toss again. Check the seasonings and serve. Put the couscous in a medium bowl. In a small saucepan, bring the broth and a pinch of salt to a boil over high heat, then pour it over the couscous. Tightly cover the bowl with plastic wrap and let stand until the couscous is tender and the broth is absorbed, about 5 minutes. Gently scrape and fluff the couscous with a fork and serve as is (stir in a little butter or olive oil, if you like) or continue with another preparation. 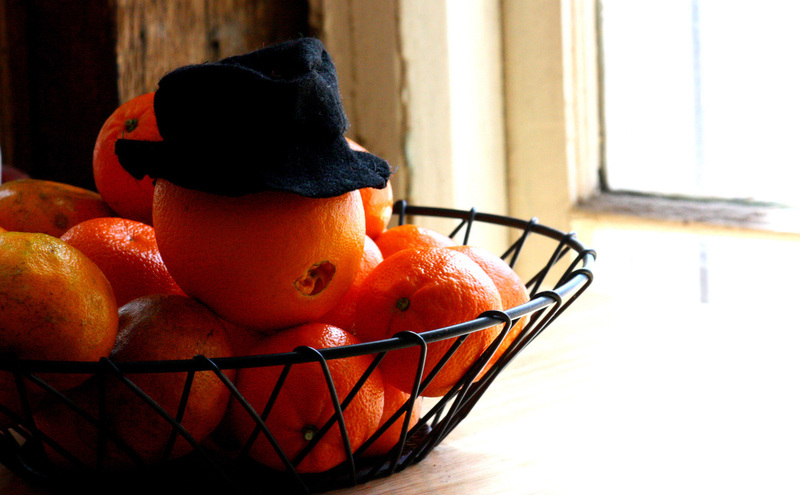 Could you use orange or clementine peel instead of tangerine? I think so, if you could remove most of the white pith. But tangerines are relatively thin-skinned, so they're easier. Ground bean sauce is a fairly thick, smooth, brown fermented soybean paste you can find at most Asian markets (Koon Chun makes a widely available version.) It's also called "yellow bean sauce" or "brown bean sauce" and is essential to this recipe. For the marinade, whisk the rice wine and cornstarch together with a fork until the starch dissolves. Mix in the honey, white pepper, Szechuan peppercorns, if using, and soy sauce. Add the chicken pieces and toss well. Set aside while you prepare the rest of the ingredients. Remove all of the peel from the tangerine, pulling off any stray strings of white membrane from the inside. Slice about half the peel as finely as you can into julienne strips. Juice the tangerine into a measuring cup, extracting as much as you can from the pulp. Add to the tangerine juice: the ground bean paste, cornstarch and chicken broth. Set aside. Heat a wok or heavy skillet over a medium flame. Add the oil. When the oil sends up a bare wisp of smoke, add the ginger, red onion and sliced tangerine zest. Stir-fry together for a few minutes until very aromatic; the red onion will soften and start to brown a bit on the edges. Add the snow peas and scallions and stir-fry another minute or two until the peas glisten and soften just a bit. Push the vegetable mixture to the side of the wok. Add a little more oil if necessary and raise the heat to high. When the oil starts to smoke, add the chicken in a single layer. Let it sit in the wok for a moment to brown a little on one side before disturbing. Cook another minute or two until just barely opaque, then mix in the vegetables. Finally, add in the tangerine-bean paste mixture (whisking to blend again first if necessary) all at once. Stir-fry well until the sauce is glossy and slightly thickened, another minute or so. Finally, add the vinegar to taste and serve at once. These are adapted from José Pizarro's new Spanish Flavors (Kyle Books, 2013). I love almond fillings — the nuts make for a just barely chewy texture that helps you slow down so you can enjoy (in this case) the scent of oranges and toasted pine nuts. For superfine sugar, you can simply blitz regular granulated sugar in a food processor or blender until powdery and fine. Also, to prevent the almonds from turning to almond butter when you grind them, you can grind them together with the flour all at once. Finally, if you can't find candied orange peel, here's a recipe. Turn out onto a floured surface and knead briefly until smooth. Chill for 15 minutes. Then, if making tartlets, cut into 8 pieces. Thinly roll out the pastry and use to line either 8 buttered tartlet pans with 1/2-inch sides or a single 9-inch tart pan. Refrigerate for 20 minutes. Put a baking sheet on the middle shelf of the oven and preheat it to 400 degrees F. Line the pastry crusts with foil and a thin layer of baking beans and bake for 15 minutes. Remove the foil and beans and bake for another 3 minutes. Remove from the oven and set aside. Reduce the oven temperature to 350 degrees. For the filling, beat the butter, sugar and orange zest together until light and fluffy. Gradually beat in the eggs, then the flour. Fold in the ground almonds, pine nuts and chopped candied peel. Spoon the mixture into the pastry crust(s) and smooth the top. Bake in the center of the oven for 35 to 40 minutes for the individual tarts, or 45 to 50 minutes for the large tart, until puffed up and golden and a skewer, inserted into the center, comes away clean. Remove the tart(s) from the oven and cool for 10 minutes. Warm the marmalade with 2 teaspoons of water in a small pan. 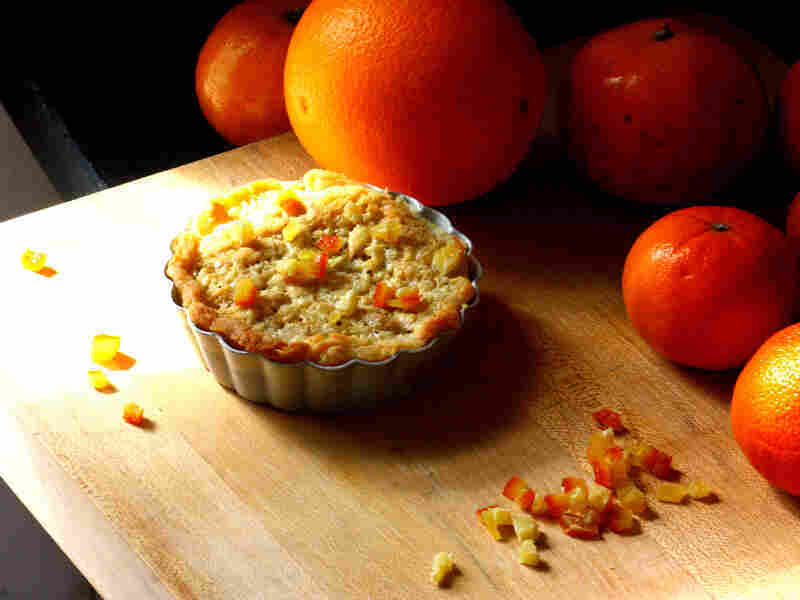 Brush the tart(s) with the marmalade, scatter a little chopped candied orange peel on top and serve warm or cold.